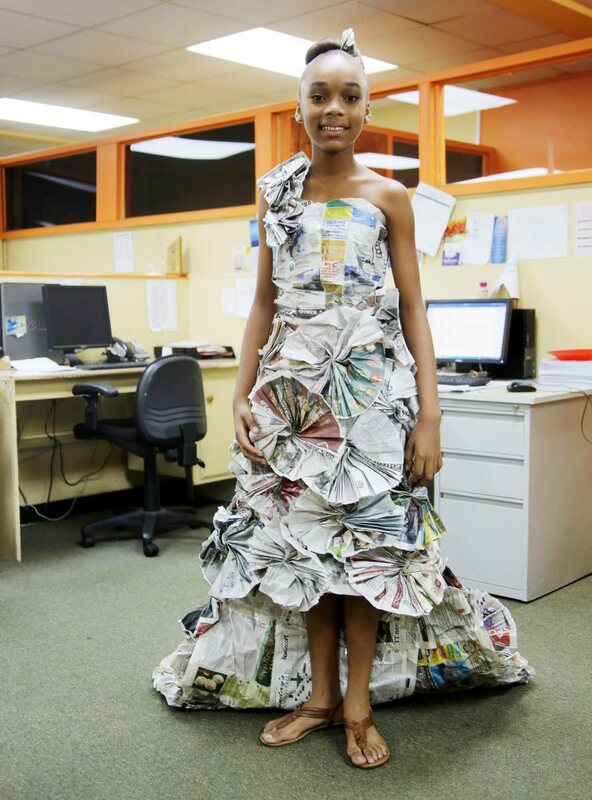 Twelve-year-old Xolani James caused quite a stir when she paraded through the corridors of her school, San Fernando Central Government Secondary, in a dress made of Newsday newspapers. 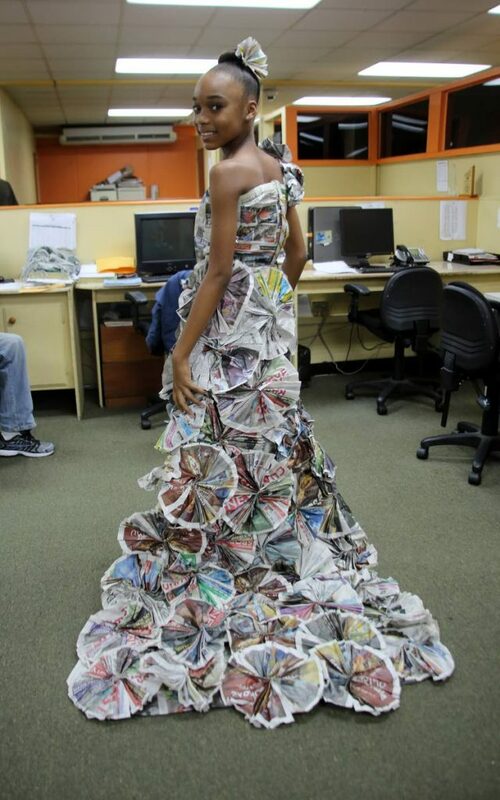 The avid Newsday reader explained the idea to make a paper dress arose in a class project assigned in November. She is a form one student and her teacher, Mrs Gomez, as part of a technical education project, asked the class to come up with a proposal on starting their own businesses. The class was divided into groups of five, and the students began brainstorming about a name and a product. Xolani (pronounced Zolanee) thought about a fashion store with unusual designs. The name Extreme Fashions came to mind. The concept was to create unique styles. 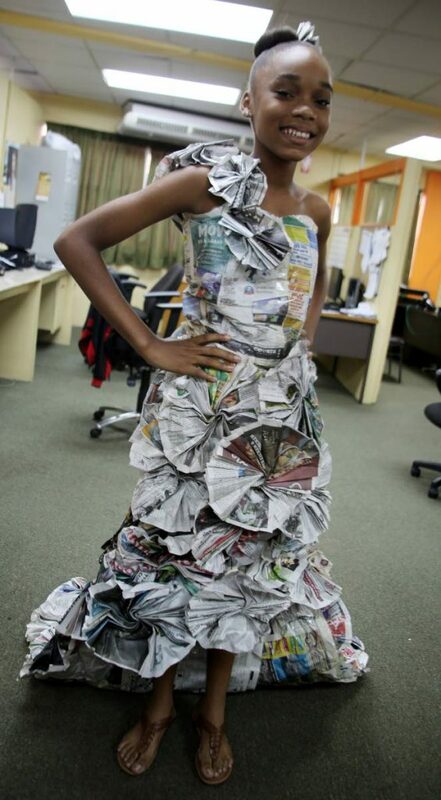 She remembered reading about a dress made of newspapers and decided to discuss it with the classmates in her group. They were skeptical about a "paper dress" and called the idea "crazy". Not one to give up easily, Xolani pitched the idea to her mother, Tracy Boyd-Daniel. Her mother was excited and the two discussed how the dress could be made. Her mother visited Newsday's San Fernando offices, at Carlton Centre, and requested old newspapers for Xolani. The staff agreed on the condition that they get to see the finished dress. Every day, Xolani would carry a stack of newspapers to school, separate them page by page and folding them into fans. Her four classmates still doubtful about where this was going, nevertheless continued to assist with folding the papers. The base of the dress was bristol board and the folded newspaper fans were stapled onto it and then opened up. The design was finished at her home on John Street, Marabella and the dress was carefully folded and taken to school. On the day the project was to be handed in, Xolani told her teacher she would have to put on her dress. Her teacher and classmates were shocked when she walked out wearing her newspaper dress with two girls holding the train as she made her grand entrance. A pleased Mrs Gomez asked her to walk along the corridors to show off her dress and a proud Xolani was only too willing to model her design. Needless to say her group got the highest marks in the class. And Xolani is well on the way to working on her next new idea...making waves in the fashion industry. Reply to "Xolani goes high fashion, Newsday style"